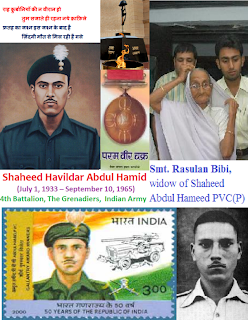 Company Quarter Master Havildar Abdul Hamid (July 1, 1933 – September 10, 1965) was a soldier in the 4 Grenadiers, Indian Army, who died in the Khem Karan sector during the Indo-Pakistani War of 1965, and was the posthumous recipient of the Republic of India‘s highest military decoration, the Param Vir Chakra. The award was announced on 16 September 1965, less than a week after the battle that cost his life. 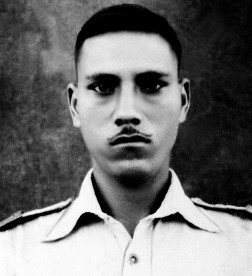 During the India-Pakistan war Vir Abdul Hamid had blasted several tanks of the enemy country. 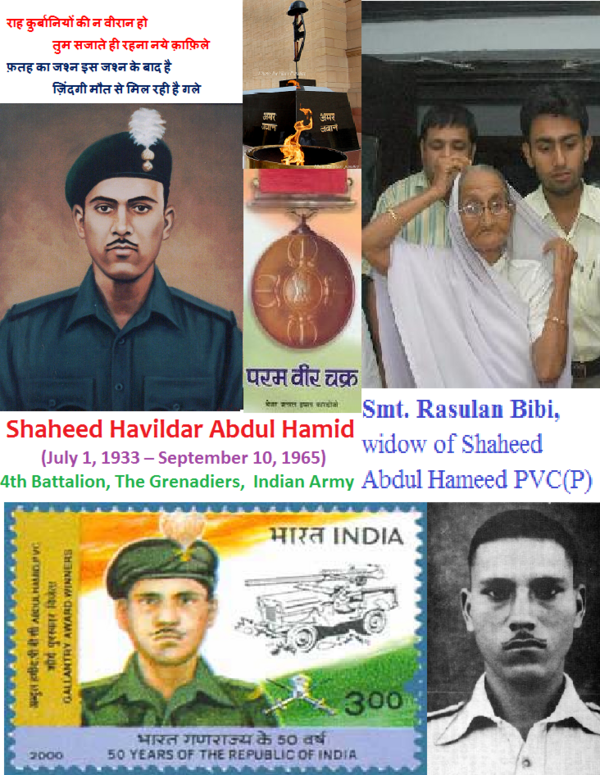 For his bravery, Hamid was awarded posthumously with the country’s highest military decoration Pram Vir Chakra.. The award was announced on 16 September 1965, less than a week after the battle that cost his life..The award was presented to his spouse, Shrimati Rasoolan Bibi by Dr Sarvepalli Radhakrishnan, then President of India during the 1966 Republic Day Parade. 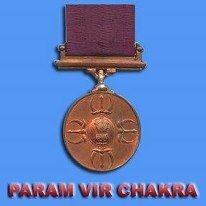 The Param Vir Chakra is awarded for most conspicuous bravery or some daring or pre-eminent act of valour or self sacrifice, in the presence of the enemy, whether on land, at sea, or in the air. The decoration may be awarded posthumously. 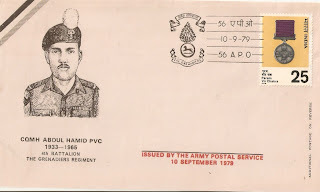 Abdul Hamid was born in a Muslim Darzi family at Dhamupur village of Ghazipur District of Uttar Pradesh on July 1, 1933, the son of Mohammad Usman, who was also a wrestler. He was enrolled in the 4 Grenadiers on 27 December 1954. In the 1988 Television serial Param Vir Chakra by Chetan Anand, Abdul Hamid is played by actor Naseeruddin Shah. The Vice President, Shri Mohd. 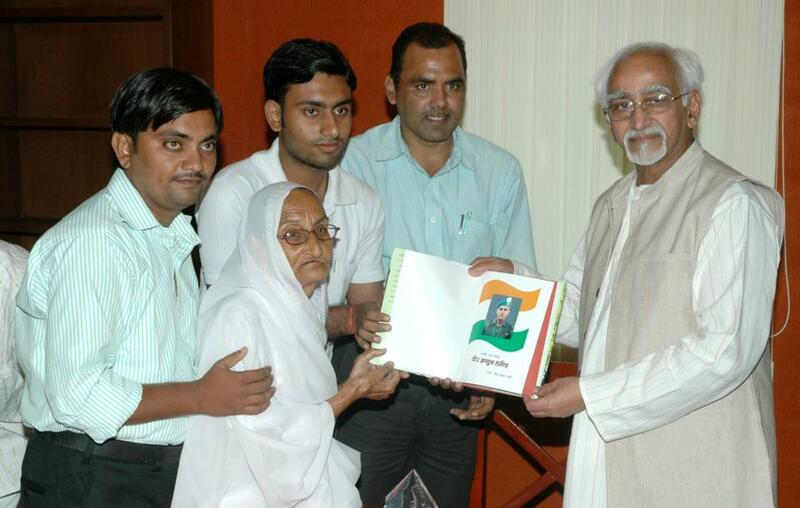 Hamid Ansari releasing a book entitled “Veer Abdul Hamid” authored by Shri Syed Ahsan Ali, in the Presence of Smt. Rasoolan Bi, widow of Late Shri Abdul Hamid, (Paramvir Chakra recipient), in New Delhi on September 08, 2009. Photo Division Ministry of I & B Government of India. Sainya Seva Medal with Clasp "Jammu & Kashmir". At 0800 hours on 10 September 1965 Pakistan forces launched an attack with a regiment of Patton tanks on a vital area ahead of village Cheema on the Bhikkiwind road in the Khem Karam Sector. 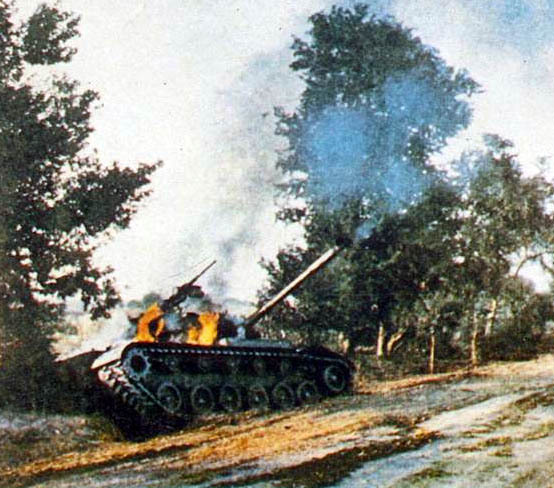 Intense artillery shelling preceded the attack. The enemy tanks penetrated the forward position by 0900 hours. Realising the grave situation, Company Quarter Master Havildar Abdul Hamid who was commander of an RCL gun detachment moved out to a flanking position with his gun mounted on a Jeep, under intense enemy shelling and tank fire. Taking an advantageous position, he knocked out the leading enemy tank and then swiftly changing his position, he sent another tank up in flames. By this time the enemy tanks in the area spotted him and brought his jeep under concentrated machine-gun and high explosive fire. 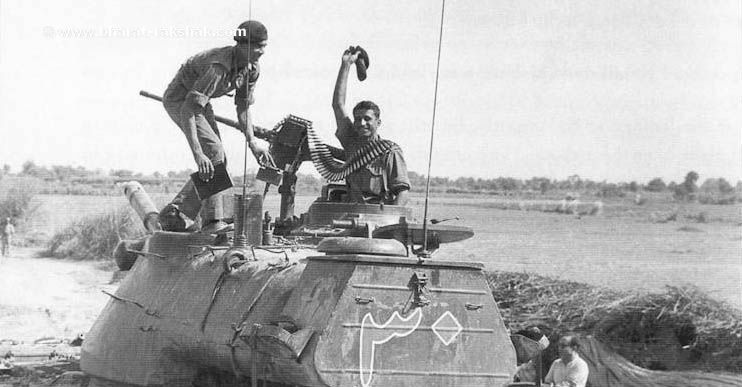 Undeterred, Company Quarter Master Havildar Abdul Hamid kept on firing on yet another enemy tank with his recoilless gun. While doing so, he was mortally wounded by an enemy high explosive shell. 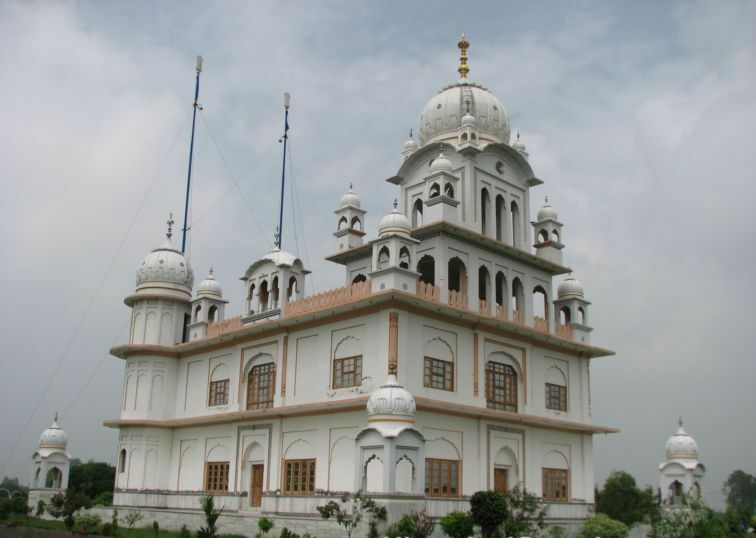 In his memory, a mausoleum was constructed on his grave by the 4th Grenadiers at Asal Uttar and each year a "mela" is organised on the date of his martyrdom. The residents of Asal Uttar have named and operate a dispensary, library and school in the village. 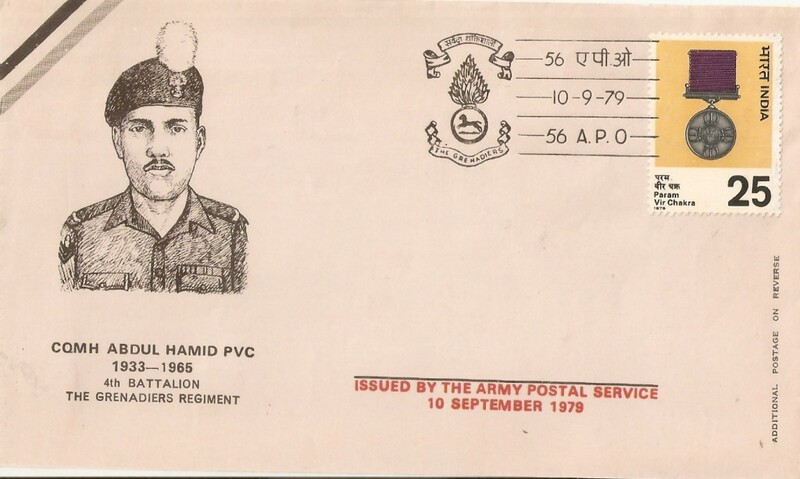 In his honour, the Army Postal Service issued a special cover on 10 September 1979. A pictorial postage stamp of value Rs 3 was issued by India Post on 28 January 2000 as part of a set of five postage stamps on gallantry award winners. 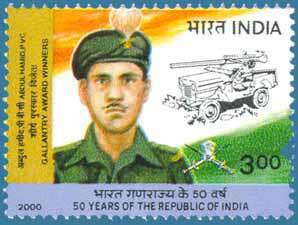 The stamp had Abdul Hamid's bust on it along with an illustration of a jeep with recoilless rifle. 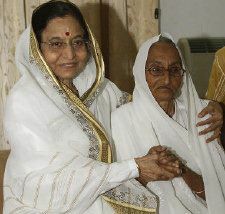 Hamid's widow, Rasoolan Bibi had met President of India Pratibha Patil in Lucknow in 2008 with a number of requests including creation of a military recruitment center in his village, converting Hamid's home in Dullapur into a memorial, observing the day of his martyrdom as an occasion at the national level and help for her grandchildren to get government employment. A memorial to Abdul Hamid was constructed in his home village of Dhamupur but later fell into neglect. 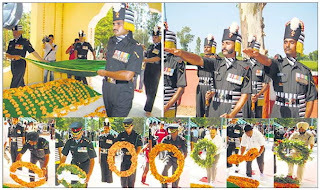 The memorial was renovated in 2011 by the Flags of Honour Foundation for the 46th death anniversary of the award winner. The renovation included the installation of a new statue of the martyr, repair and painting of gates and boundary and improvement of the garden. Indian Member of Parliament Rajeev Chandrasekhar, founder of Flags of Honour, spoke on the occasion. 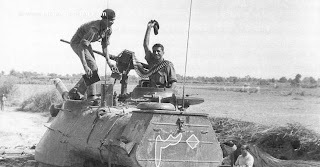 The tank battles of 1965 form part of military history as the most intense armored battles between the end of World War II and the 1991 Gulf War. 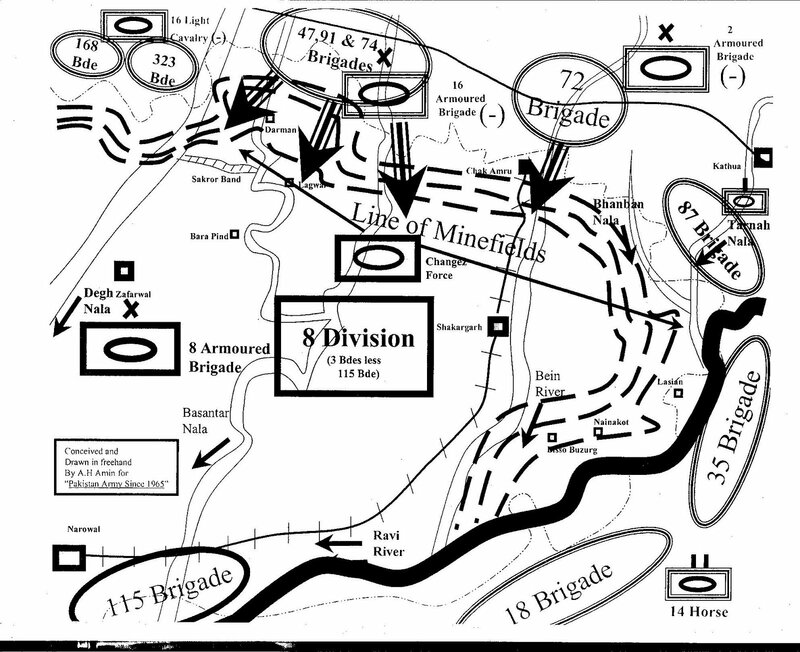 Close to a thousand tanks, on both sides, took part in the pitched battles and offensives. 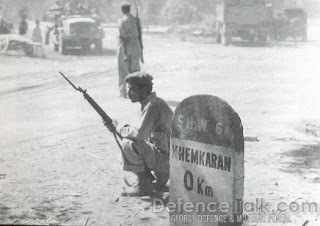 At the start of the war, Indian strength was limited to one armored division and one independent armoured brigade, along with six armoured regiments supporting infantry divisions. 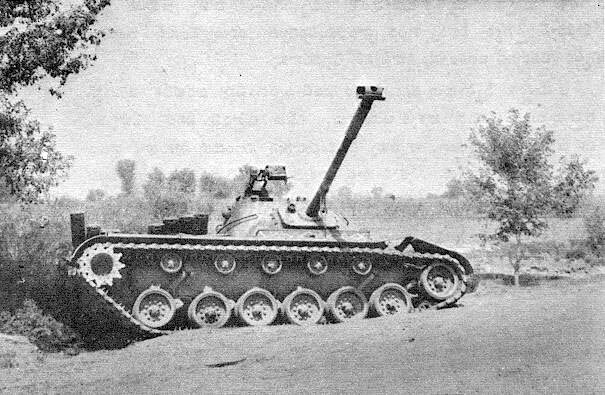 Pakistan had two armored divisions, with the then very modern M-48 Patton tanks. 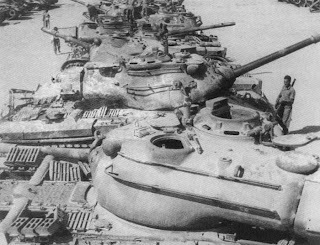 India had an equivalent tank in the Centurion, but their strength was limited to only four armored regiments. 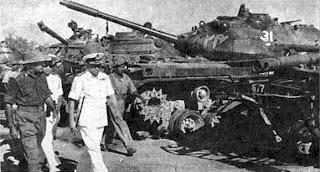 Near the Bhikhiwind village, a strip of land was called Patton Nagar for a short while in 1965.It was here that more than 60 tanks of the Pakistani army were displayed at the end of the September India-Pakistan conflict. 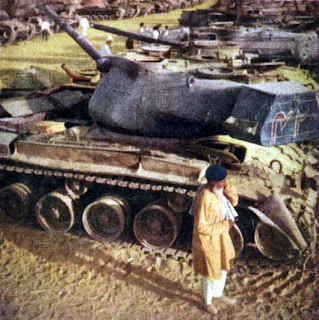 The Pakistan Army tanks were captured at the Battle of Asal Uttar by India's 4 Mountain Division and it became a memorial to the Pakistani tanks being bogged down in the marshes during the 1965 War. 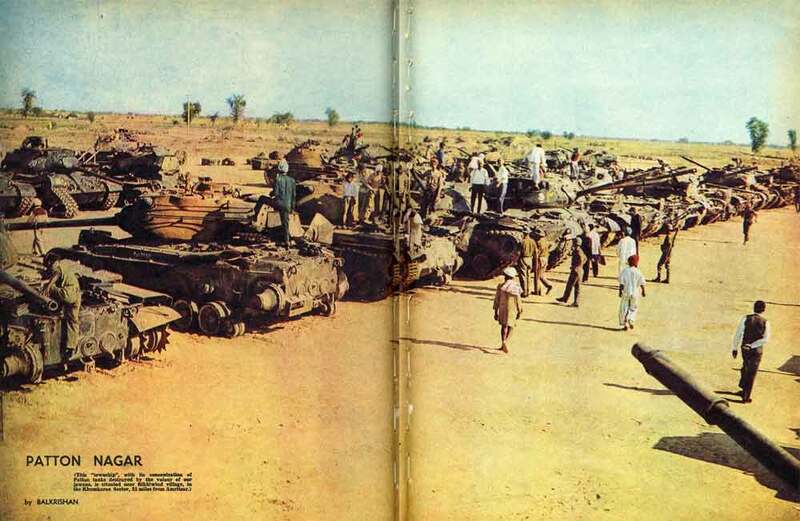 The tanks were displayed for some time after which they were shipped to various cantonments and army establishments in India for display as war trophies. The Indian Army managed to capture 97 Pakistani tanks as a result of the botched assault by the 1 Armoured Division of the Pakistan Army at the Battle of Assal Uttar on 10 September 1965.Six Pakistani Armoured Regiments took part in the battle, namely the 19 Lancers (Patton), 12 Cavalry (Chaffee), 24 Cavalry (Patton) 4 Cavalry (Patton), 5 Horse (Patton) and 6 Lancers (Patton). 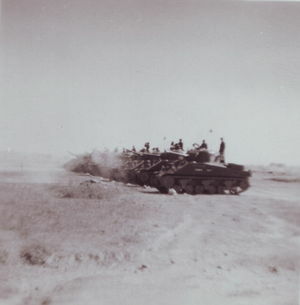 The Indian forces in the field that day consisted of three Armoured regiments with tanks of varying quality, the Deccan Horse (Shermans), 3 Cavalry (Centurion) and the 8 Cavalry (AMX- The battle was so fierce and intense that at the end of the war, the Pakistani 1st Armored division had lost about 97 tanks in destroyed/damaged or intact condition. 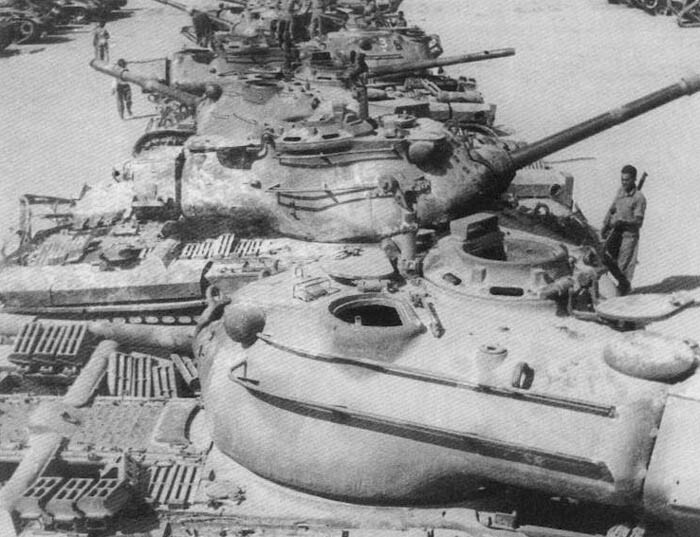 This included 72 Patton tanks and 25 Chaffees and Shermans. 32 of the 97 tanks, including 28 Pattons, were in running condition. The Indian 4th division lost 32 tanks, mostly Sherman tanks, fifteen of which were captured by the Pakistan Army. 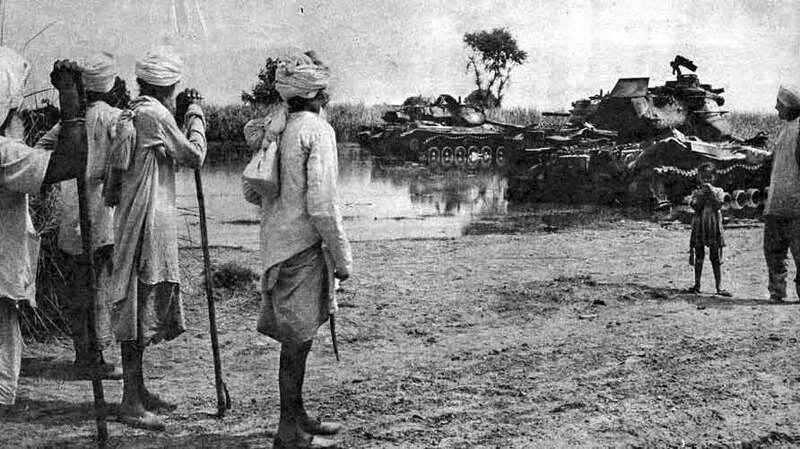 The 1965 Indo-Pakistani War was witness to the largest tank battle in military history since World War II. 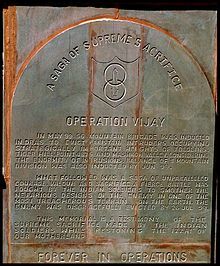 This battle led to the creation of Patton Nagar (or Patton City) at the site of the battle viz., Khemkaran. 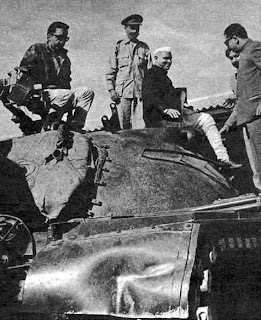 This is because many Patton tanks fielded by the Pakistani forces were either captured or destroyed at the scene. 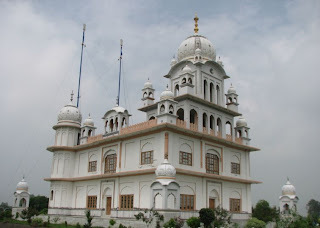 Guru Tegh Bahadur Sahib (1621-1675) Ninth Sikh Prophet visited Khem Karan and Stayed here a local Built a Well in Memory of Guru Sahib a Old Building Gurdwara Stood here which in 1965 during the Indo-Pak war The Pakistani Army Captured Khem Karan Town The Locals Fled. 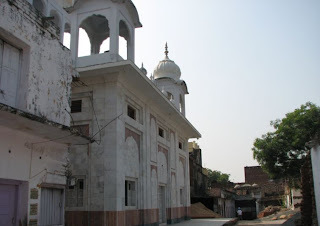 The Pakistani Army damaged The Historic Gurdwara Much Damage was done to it it was when the Indian Army Arrived and After a battle the Indian Army won the battle Pushing the Pakistani Army out from this Area that the Sikhs Repaired the Gurdwara and Renovated it again. 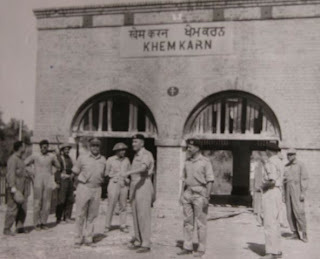 Before the partition Khem Karan used to be in Lahore District During the Partition it was Given to Amritsar Sahib to East Punjab (India). 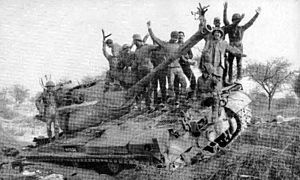 The tank battles of 1965 form part of military history as the most intense armored battles between the end of World War II and the 1991 Gulf War. 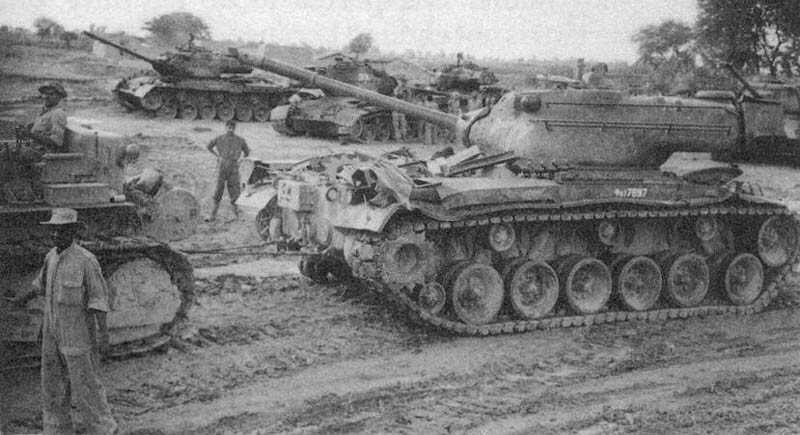 Close to a thousand tanks, on both sides, took part in the pitched battles and offensives. 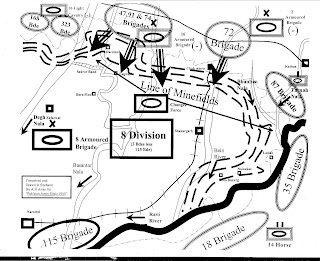 At the start of the war, Indian strength was limited to one armored division and one independent armored brigade, along with six armored regiments supporting infantry divisions. Pakistan had two armored divisions, with the then very modern M-48 Patton tanks. 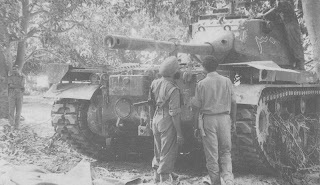 India had an equivalent tank in the Centurion, but their strength was limited to only four armored regiments. President Dr. Sarvapalli Radhakrishnan visits Bhikiwind's Patton Nagar. 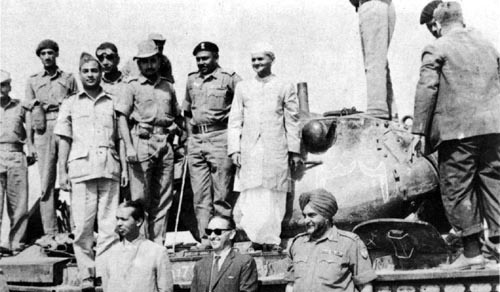 At left is Lieutenant General Harbaksh Singh, Padma Bhushan, VrC, GOC Western Command and Lieutenant General Paramasiva Prabhakar Kumaramangalam, who later rose to the rank of General and held the post of Chief of Army Staff from 1966 to 1969. 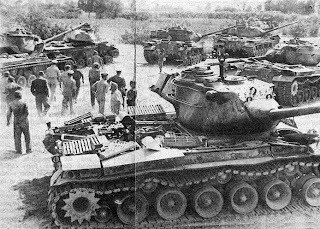 The Pakistan Army's elite 1 Armoured Corps met its Waterloo in the Battle of Assal Uttar as they lost nearly 100 tanks, many of them being brand new M-48 Pattons. Bhikiwind was used as a temporary tank cemetery to house some 60 captured & destroyed M-48 Pattons, M-24 Chafees and M4 Shermans. 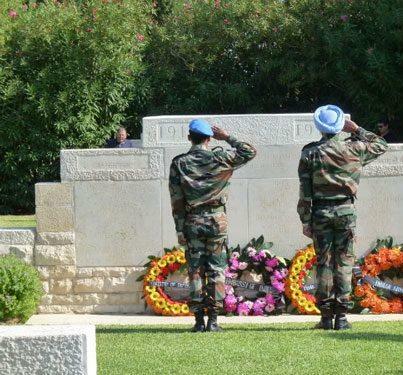 The cemetery stood as a standing memorial to Pakistan's humiliating defeat in the battle of Assal Uttar. 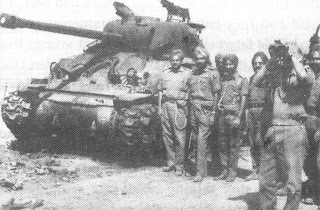 A knocked out Pak Army tank in the Phillora Sector in Pakistan, being inspected by Indian Jawans. A captured Patton, abandoned intact by the Pakistan Army, in the muddy waters of Assal Uttar. Notice the hastily-put camouflage on the tank's turret. 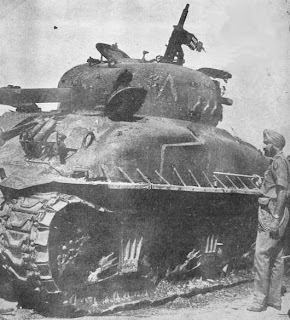 Lieutenant General Harbaksh Singh examines a captured M4 Sherman tank in the Chawinda sector. A Pak Army Patton burning on the roadside, after being hit. Once captured in these burning tanks, the poor souls in there literally baked to death. 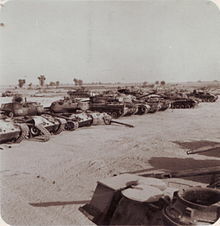 Pak Army tanks lined up at Patton Nagar at Bhikiwind, 25 miles from Amritsar in Punjab. The tanks were kept here for only a few months after the 1965 war, before being siphoned off to various army establishments and cantonments as war trophies. 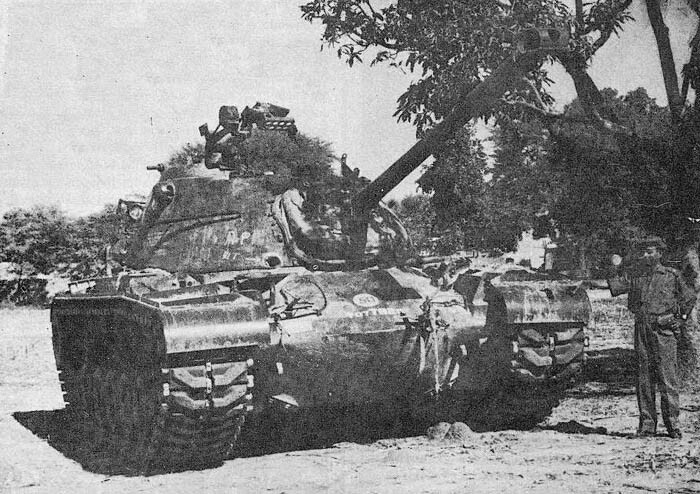 A Pak Army Patton destroyed & abandoned on the road to Khem Karan. As far as the eye can see, Pak Army tanks are lined up for display at Patton Nagar in Bikhiwind near Amritsar, Punjab. 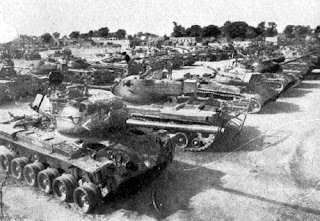 A panoramic image of Patton Nagar, with the Patton tanks of Pakistan's elite First Armoured Division lined up for display at Bikhiwind, 25 miles from Amritsar, Punjab. Abandoned Pak Army Pattons captured in the wheat fields of Mahmudpura, in the Khem Karan sector. The farmers had to wait for the arrival of the EME (Electrical & Mechanical Engineers) to move the Pak Army tanks, so they could do their work. However at times, the farmers used to work around these tanks. Pakistan Army Pattons neatly lined up at Patton Nagar in Bhikiwind. 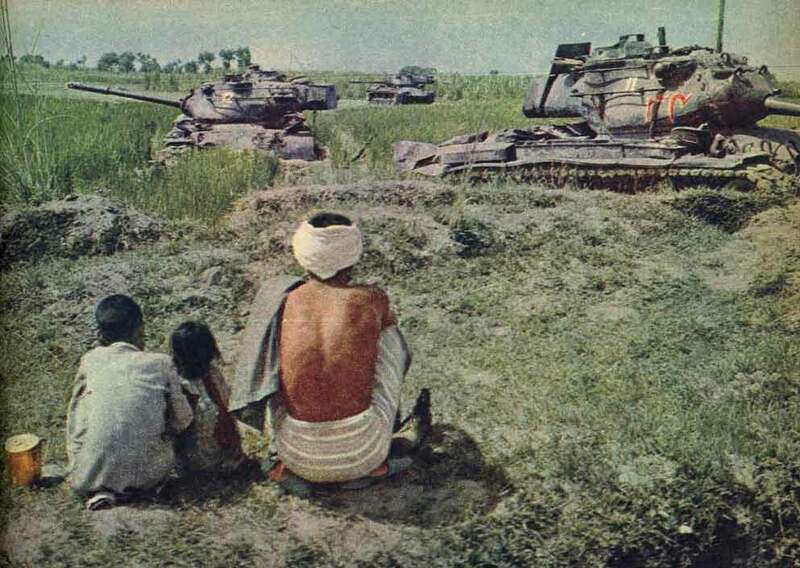 Farmers wade through a field, filled with abandoned Pak Army tanks. 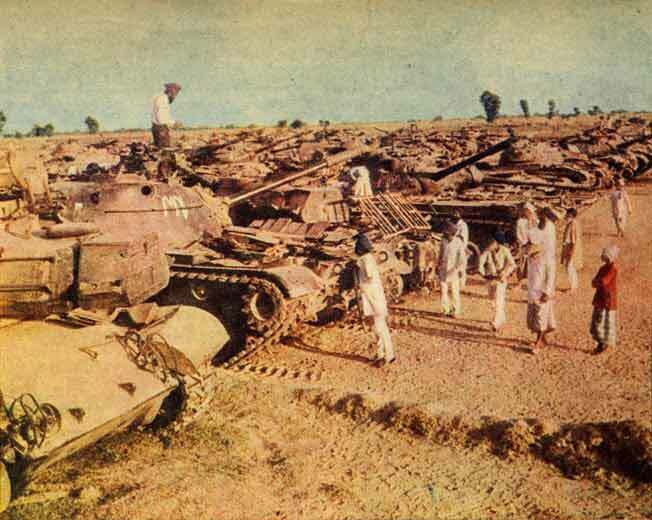 The Pakistan Army lost many tanks this way, when they attempted to cross the muddy wheat fields of Punjab. Six Pattons at Bhikiwind. All captured tanks were carefully numbered and accounted for by the Ordnance Corps. 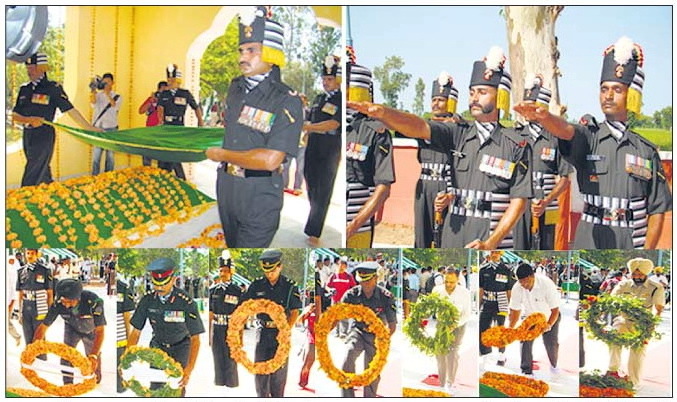 Later on, they were allocated as 'War Trophies' to different units / formations all over India. 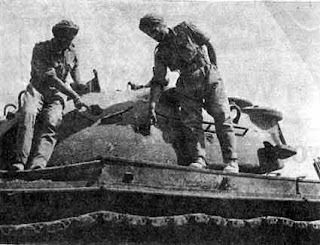 A damaged Patton is recovered by the EME (Electrical & Mechanical Engineers). Note the shell hole on the turret, at the bottom near the rim, which is marked out in white as AP Hit, which is Armour Piercing Hit. 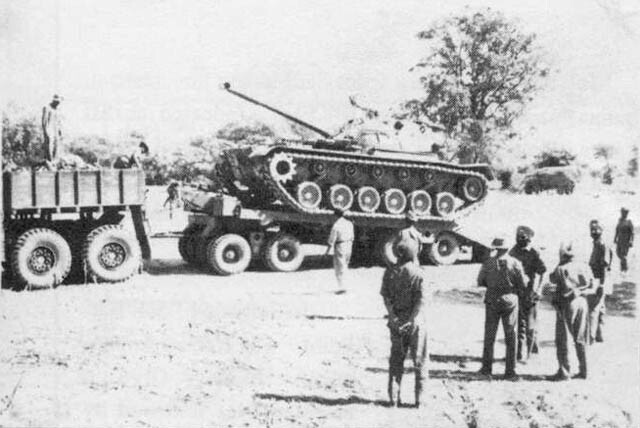 A captured Pak Army M-24 Chafee, being loaded onto a tank transporter. 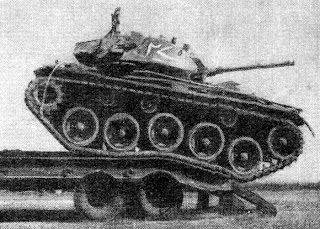 Seen here being loaded onto a tank transporter, destined for Bhikiwind, is a Pak Army M-48 Patton. Lieutenant Generals Harbakhsh Singh and Joginder Singh Dhillon, along with other army personnel, stand next to an abandoned Pak Army M4 Sherman tank. Watch Out - Heavy Load Coming Through! A bulldozer tows a captured Pak Army Patton to Bhikiwind. In the background, more tanks await to be towed. Prime Minister Lal Bahadur Shastri atop a captured Pak Army Patton. Villagers inspect a watery graveyard of Pak Army Patton tanks at Mahmudpura village. More than the tank, it was the man behind the gun that counted and India's jawans proved they were the best. 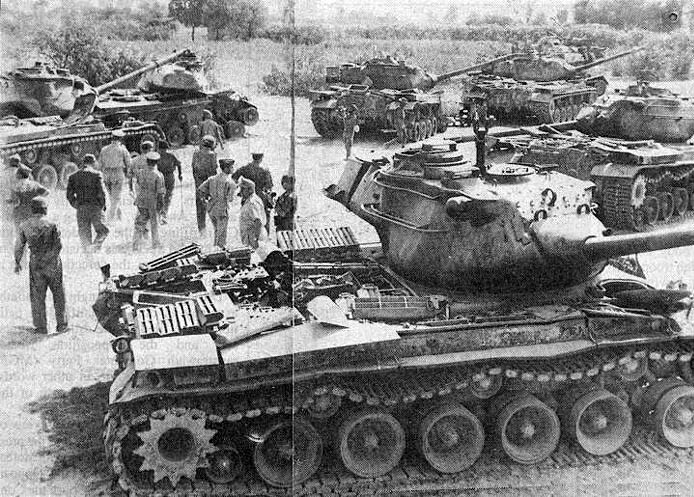 Indian Army Centurion tanks give a tow to captured Pakistan Army Patton tanks, in the Chawinda sector. Pak Army Pattons lie scattered in the fields of Punjab. 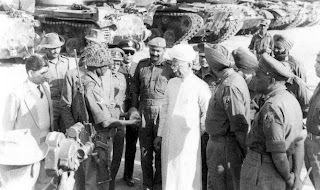 Vice Admiral Bhaskar Sadashiv Soman, Chief of Naval Staff, paid a visit to Patton Nagar - the suburb near Bikhiwind Village, about 25 miles from Amritsar, named after the famous tank of which the Indian Army took such heavy toll. In this township are to be seen 94 of the tanks, the bulk of them American Pattons, that were the pride of Pakistan's 1st Armoured Division. These two hits registered by the Indian Armoured Corps on the turret of a Patton, spelt the ruin of this Pakistani tank. It happened in Kalra, in the Khem Karan sector. 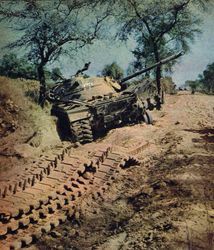 A Patton lies abandoned, after running into a ditch, on the roadside at Khem Karan. The Pak Army was in such a hurry to go back, that they left whatever they could not take back immediately. 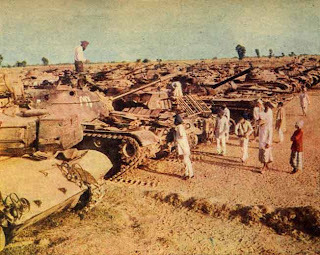 Destroyed Pakistani tanks arranged at "Patton Nagar"
Near the Bhikhiwind village in the Khemkaran area, a strip of land was called Patton Nagar for a short while in 1965.It was here that more than 60 tanks of the Pakistani army were displayed at the end of the September India-Pakistan conflict. 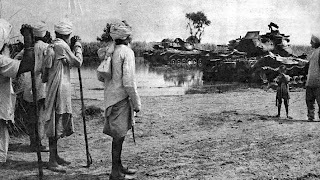 The Pakistan Army tanks were captured at the Battle of Asal Uttar by India's 4 Mountain Division and it became a memorial to the Pakistani tanks being bogged down in the marshes during the 1965 War. The tanks were displayed for some time after which they were shipped to various cantonments and army establishments for display as war trophies.